Kruger park Lodge is a true African adventure set amongst the natural vegetation of the Lowveld region. 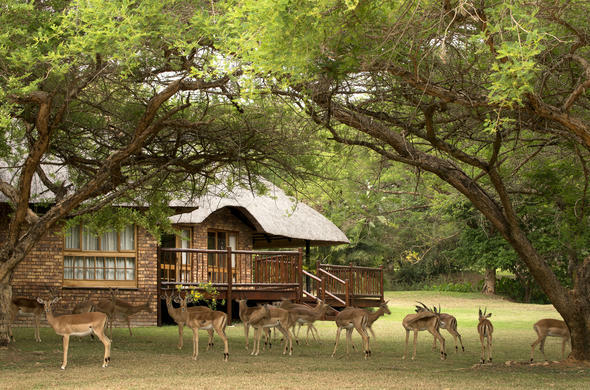 Kruger Park Lodge is an oasis of dense woodlands, lush green lawns and flowing water. Set on the banks of the Sabie River, the lodge is well appointed and is only a 10 minute drive from Kruger National Park. This place is the perfect starting point for an unforgettable experience in Africa and guests accommodation is offered in self-catering chalets that overlooks a beautiful golf course. This lodge near Kruger National Park in South Africa is set in the heart of the bush without having to compromise on comfort and style. While staying at Kruger Park Lodge, explore the renowned attractions within the area such as Kruger National Park, Blyde River Canyon, Pilgrims Rest and God's Window. The resort has tennis, mini golf, nature walking facilities, 3 swimming pools and kids entertainment facility to keep you busy. Enjoy a lovely family braai or enjoy a meal at Rapids Restaurant / coffee shop.